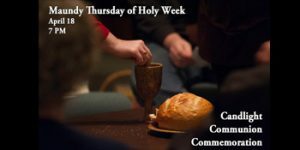 Our community of faith will commemorate the events of Holy Week with four special gatherings, each at the Carmichael Chapel. Won’t you join us? Palm Sunday: April 14, 10:30 AM. Palm Sunday marks the beginning of Holy Week and the triumphal entry of our Lord into Jerusalem. It also signals that the biblical drama of the salvation of the world is now rapidly moving to a climax. Scripture tells us that as Christ drew near to the city gates, the people welcomed him with shouts of “Hosanna, blessed is he who comes in the name of the Lord.” Others waved palm branches and spread their cloaks on the road before Him in an act of royal homage. Join us on Palm Sunday as we lift up our “Hosannas!” to the Lord. Maundy Thursday: April 18, 7 PM. A service that our worshiping community eagerly looks forward to, we’ll gather for an evening of prayer, contemplation, and communion. The word “Maundy” derives from the Latin translation of the phrase “A new commandment I give you…” (Mandatum novum…), which Jesus shared with His disciples on the night of the Last Supper and before His passion. Part of our Maundy Thursday service will include some intentional time of quiet contemplation as we consider the cross. More information here. Holy Saturday Vigil: April 20, 6 PM. Join us for this very moving Holy Saturday service at Epiclesis. The Easter Vigil has a long history in the Christian church, going all the way back to the very first centuries of worship– in fact, in some ways it was the most important service of the entire Christian year. Look for several wonderful elements in the service, including a baptismal renewal and a big surprise to end the service. The evening will last about one hour and include Scripture and prayer. More information here. Easter Sunday: April 21, 10:30 AM. The Lenten season comes to a glorious close with the angelic announcement on Resurrection Morning, “He is not here. He is risen, just as He said!”. Easter Sunday is the high point of the entire Christian year, and has been since the beginning. Here’s something you may not know: In the early church, Easter Sunday was the day when new Christians were baptized into the faith, ending their long discipleship process. We’re continuing the Ancient-Future tradition at Epiclesis and, after the worship service, we’ll adjourn to the beautiful outdoor rose garden pool where we will baptize Jesus’ latest disciples. Mark your calendars for Maundy Thursday, April 18, at 7 PM, for a quiet, contemplative, candlelit service of worship. Maundy Thursday, the night we mark Christ’s last supper with His disciples in that upper room in Jerusalem, gets its name from the Latin phrase, “Mandatum novum,” or “new commandment.” Jesus told His followers of a new commandment that He was given them– that they love one another just as He had loved them. Our service will include Scripture, prayer, music, art, and we’ll gather around the Table of the Lord for Communion before departing in silence. The service is free and open to the public… and it’s sure to be a highlight of your Lent and Easter season. Won’t you join us? Please let us know if you have questions, and hope to see you and yours on Maundy Thursday, April 18, at 7 PM, in the Carmichael Chapel at 4600 Winding Way in Sacramento (our regular Sunday morning worship location). Epiclesis is proud to support the ATLAS Thrift Shop, a wonderful ministry of ATLAS of Carmichael, a community-based nonprofit organization that comes alongside hurting men and women with caring, compassionate support. They offer tangible assistance to those struggling with life-controlling issues through a program of resource guidance, advocacy, and mentoring. All services are free and confidential. Are you looking for a worthy organization to donate your slightly used items– or maybe a place to do some thrift shopping yourself– confident that the monies will be used for local, Kingdom purposes? ATLAS carries lots of items, including tons of clothes for women, men, and children! Your donations, and your purchases, help out a cause that benefits the entire community. The thrift shop takes in all kinds of items– even used automobiles can be donated. Check out their website for more details. 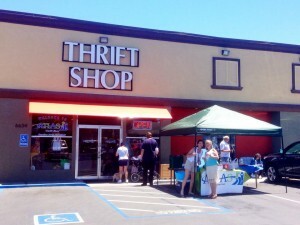 Learn more about the ATLAS Thrift Shop by clicking here. Want to see more about what ATLAS of Carmichael is doing? Please click here.